The Global Volcanism Program has no activity reports for Taryatu-Chulutu. The Global Volcanism Program has no Weekly Reports available for Taryatu-Chulutu. The Global Volcanism Program has no Bulletin Reports available for Taryatu-Chulutu. The Taryatu-Chulutu volcanic field lies in north-central Mongolia about 250 km W of Ulaanbaatar. This area, also known as the Hangayn or Tariat volcanic field, is located in a broad region of Miocene-to-Holocene basaltic lavas in the Baikal Rift System SSW of Lake Baikal. Lava flows of four Miocene-to-Holocene age groups form terraces along the Chulutu (Chuloot) River; Pleistocene basalts form the 40- to 60-m terrace of the Taryatu basin. 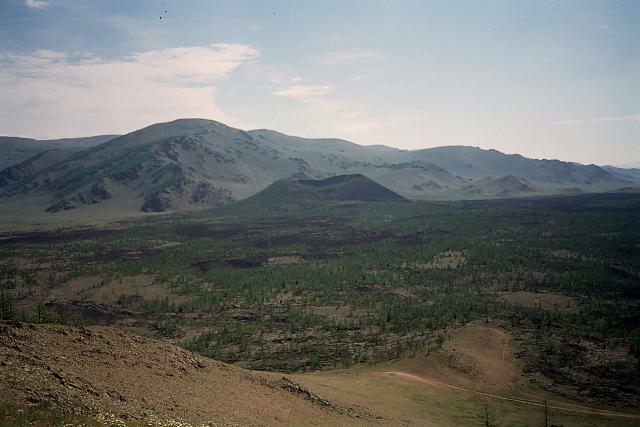 Six Holocene cinder cones, including Horgo and Dzan Tologai, are concentrated along the Sumein and Gichgeniyn river valleys at the western end of the volcanic field. The 180-m-wide crater of Horgo is breached to the south, in the direction of an associated lava flow. The Holocene cones produced thin, freshly preserved lava flows remarkable for their large numbers of ultramafic xenoliths. The lava flow from Horgo was radiocarbon dated at about 4930 years ago and dammed the Chulutu River, forming Lake Terkhin-Tsagan-Nur. Barry T L, Saunders A D, Kempton P D, Windley B F, Pringle M S, Dorjnamjaa D, Saandar S, 2003. Petrogenesis of Cenozoic basalts from Mongolia: evidence for the role of asthenospheric versus metasomatized lithospheric mantle sources. J Petr, 44: 55-91. Devyatkin Y V, Smelov S B, 1979. Position of basalts in the Cenozoic sedimentary sequence of Mongolia. Internatl Geol Rev, 22: 307-317. Ivanov A V, 2003. (pers. comm.). There is no Deformation History data available for Taryatu-Chulutu. There is no Emissions History data available for Taryatu-Chulutu. The fresh, sparsely vegetated lava flow filling this valley originated from Khorog (Horog) cinder cone (center). The cone is part of the Taryatu-Chulutu volcanic field in north-central Mongolia about 250 km west of Ulaanbaatar. The volcanic field contains six Holocene cinder cones along the Sumein and Gichgeniyn river valleys at the western end of the volcanic field. The lava flow from Khorog was radiocarbon dated at about 4930 years ago and dammed the Chulutu River, forming Lake Terkhin-Tsagan-Nur. Photo by Piotr Olszewski, 2004. There are no samples for Taryatu-Chulutu in the Smithsonian's NMNH Department of Mineral Sciences Rock and Ore collection. Large Eruptions of Taryatu-Chulutu Information about large Quaternary eruptions (VEI >= 4) is cataloged in the Large Magnitude Explosive Volcanic Eruptions (LaMEVE) database of the Volcano Global Risk Identification and Analysis Project (VOGRIPA).